Being Authentic, Real and True to Yourself! I recently coached a Jack who wanted to be like his mentor. Jack tried to be the perfect mentee. He wanted his mentor to like him. So Jack tried to second-guess what his mentor was thinking about him. Jack started to feel nervous around his mentor because he was frightened of saying or doing the wrong thing. You know when you’re in the presence of an authentic person. You gravitate towards them because they feel real. There’s a warmth and openness that makes an authentic person engaging. We are all striving to be authentic in our lives. We want to have a sense of who we are and confident enough to share it with those we interact with. Often we are scared to present our real selves to those around us because we’re frightened that others will perceive us as flawed, unworthy and they won’t like us. Fear and shame stops us from sharing our real selves with others. Instead of being natural, spontaneous and genuine, we unconsciously become inauthentic: we tell others what they want to hear, we pay ‘lip-service’ to the truth, and don’t speak up when it really matters. You let yourself down and feel dishonest for misrepresenting your own beliefs. 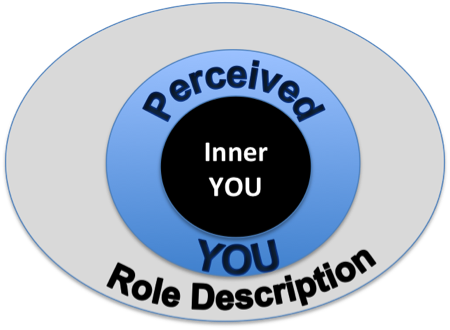 Inner YOU: This is the window into the ‘real you.’ How YOU think and feel on the inside. This YOU is natural, genuine, spontaneous, humourous and open. It’s your authentic self where you are aligned, joyful and relaxed. 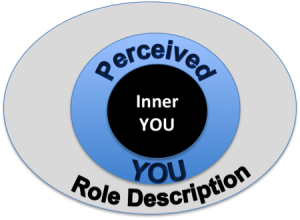 Perceived YOU: This is the YOU that other people perceive you to be. Usually described by other people’s feedback of you. ‘You’re lazy!’ ‘You don’t think!’ ‘You’re unorganized!’ Have you ever spoken to someone who perceives that they know more about you than YOU do?! Role Description: In life we play many roles simultaneously. It’s easy to put on our role description hat and say what we think we should say to please the other person. Playing the political game to keep the peace. (How many times have you done this to your boss?!) We live by unconscious rules that we’ve created and these can limit our potential. Instead of living from the inside-out and presenting our authentic self to the world around us, we sacrifice our authenticity in an effort to become how others perceive us to be, or in alignment with our role descriptions and how we think we should behave for others to like us. We live life from the outside-in. This takes a lot of effort and energy to maintain because we’re fighting a battle with our true self! It’s self-defeating cycle that is fed by shame and fear. Authenticity is about being comfortable in your own skin. 1. What are your triggers? Do you feel uncomfortable and incongruent in any relationships? Do you constantly worry about who you’re supposed to be and how you’re supposed to act? 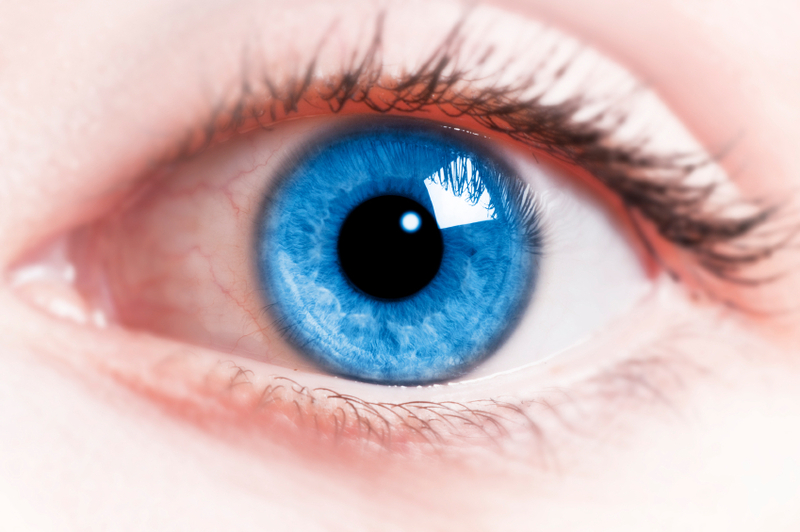 Are you unclear about who you want to be? 2. Write them down. Start to notice when this is happening and write down WHAT is happening and HOW you feel. WHY are you acting in this way with that person? 3. Share it with a coach. Reach out for someone to talk to. Being able to talk honestly about your feelings and your needs can make a BIG difference. A good coach can help you become more authentic. They will help you to shift old mindset patterns that block your success. 4. Be the person you want to be. What do you really want? You may know what you don’t want. This is a good place to begin. People love you for who you are. You don’t have to pretend to be something or somebody else. Be PURE YOU… start to explore what this means for you. 5. Let go of the role description hat. You are much more that the roles you play in your life. You don’t have to be everything to everyone else. You just have to learn how to be YOU. Allow your essential self to shine through. Being YOU is very liberating! A very well written and useful post. ← How Strong is Your EGO? !